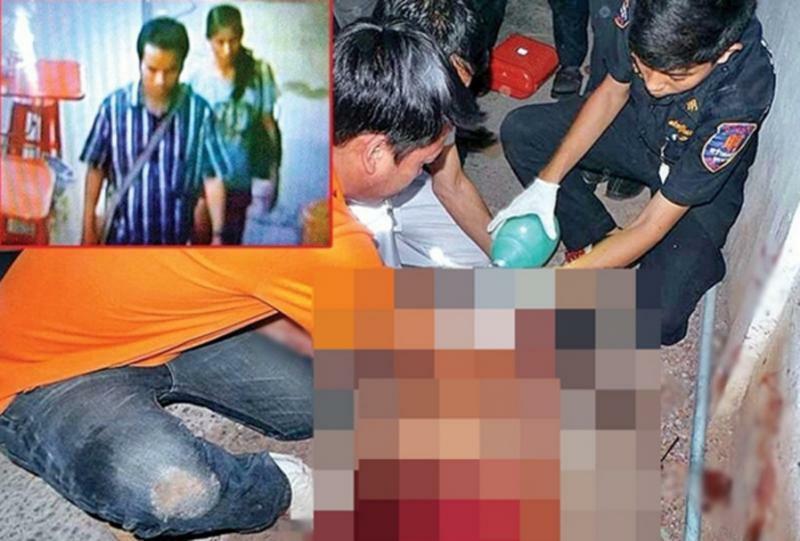 UDON THANI:-- A woman six months pregnant was stabbed multiple times in a vicious murder that has shocked Udon Thani, reports Thaivisa News. A massive manhunt is underway as police search for the jilted lover of the woman whose baby also died in the savage slaying on Sunday. Chamaiporn Ruangphung,31,was left bleeding to death by the side of the road in central Udon after she walked home from a noodle restaurant where she worked as a waitress. She was stabbed a total of 16 times in the neck, chest and palm and despite the efforts of medical staff at Udon Thani hospital succumbed to her injuries. Udon police said that the victim lived just three hundred metres from the noodle restaurant where she worked in Soi Pracha Uthit 2, downtown Udon. Possibly expecting trouble following an earlier altercation with her ex-boyfriend she had taken a circuitous route home. But her assailant caught up with her and attacked her in the street. Witnesses at the restaurant said that several days ago a man called Ping had shown up. He was apparently a man that the victim had split up with some time before. He had asked to get back together again but Chamaiporn had rejected him. Earlier Sunday he had turned up again on a Honda Wave and banged on the glass frontage of the shop demanding to speak to her. She had rejected him again and police suspect the man left in a foul temper. A police spokesman said that the victim left the restaurant alone after work but was attacked in a soi. Nothing was stolen and police are checking her phone to see the latest calls she made and received. Further inquiries revealed that Chamaiporn had been married to another man and had had a child with him. Some years ago she met Ping and they even went to Bangkok together before they split up when the victim returned to Udon to work. Police said that they suspect that Ping is staying with a friend in the Udon area or may have returned to Sakon Nakorn where he lives. They expect to make an arrest quickly. I'll go on saying it. Violence in Thai life is rife. It is an interesting Q whether life is better or worse anywhere else! That's a terrible story, and i wonder how there was not a single soul to help the poor lady. I think, in general, we are running too fast, we should stop and think what's going on ? Very sad indeed. If he ignored her and focused on an independent money making business and was successful, she may have reconciled and decided it was best to return to the relationship for the child/security, if in fact the child was his. If she didn't return there are a few million women that would be interested! Presently it appears all lives are gone. Unfortunately most, not all, Thai men think like 5 year old's and believe that life is like in the cartoons. Society has to come down on these scum bags hard and I don't mean Baht1,000 fine. They need minimum sentences say 2 years hard labor for an attack and life / execution in the cases were a death occurs. They wont of course as the prime interest in the country is money; life does not carry a value hence they kill with impunity. When caught they come up with the most ridiculous excuses that only a 5 year old could think of.